A common question people ask is; how many soakwells do I need? The Department of Water encourages infiltration of rainfall events at or near source as a primary means of urban stormwater management to maintain the site water balance as close as possible to its pre-development hydrology. This means ideally the rain should be returned to the ground where it falls to maintain the water table. Using soakwells allow us to do this when most of a block is covered by an impervious surface ( roof / paving ). Building on this, by law in Western Australia home owners have an obligation to confine any stormwater run-off within the boundaries of their property. The calculation provided by the council is used to ensure that during storms your sytem will cope. No damage will be caused and no water will leave your property. Assess the site for available space taking into consideration the minimum distance form footing and boundaries and the size of the soakwell. 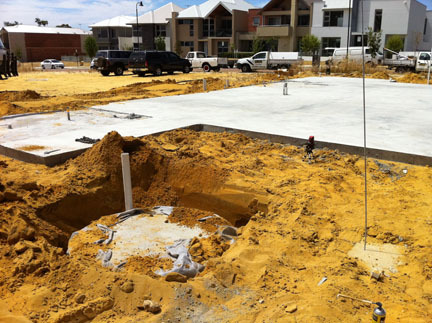 Stormwater drainage must conform to the Australian Standards set out in AS 3500.1/3. If no council regulation is given, the 1 in 20 calculation can be used (roof area x .0125 = req. vol). Please note while every effort is made to provide up to date information the onus is on you to ensure it is accurate. Also note that each council will have a minimum distance for the soakwells from the house or boundary. Disclaimer - This information is provided as a guide only. While every effort is made to provide up to date information All About Soakwells recommends contacting your council and will not be held liable for any work commenced by anyone other than an All About Soakwells Contractor, even in such cases where the work is recommended by All About Soakwells by means of advice, a quote or any other means. For easy soakwell calculations try this handy soakwell calculator based on council regulations. All About Soakwells is based in Perth and only conducts installations to council regulations and the building code of Australia. We are committed to only using quality materials and do not cut costs by using standard lids (non trafficable), sub standard soakwells, not wrapping soakwells in geotextile fabric or omitting compaction. We are happy to provide you with assistance and will answer questions you may have. We are committed to ensuring the citizens of Perth are fully aware of what is required for a legal and functional stormwater drainage system.